J.H. Rudolph & Co., Inc. is committed to providing quality asphalt paving products that adhere to the highest testing standards in today’s asphalt industry. All of our plants are INDOT Certified Mix Producers with fully equipped labs staffed with Certified Quality Control Technicians. All of our customers, big and small, receive the same high-quality asphalt mixes which are tested on a regular basis, regardless of the size and scope of the project. We provide only the best materials available today. Our standard testing procedures look at Air Voids, VMA, Binder Content and Gradation as per the DMF. Our procedures ensure consistently superior products that deliver outstanding performance to our customers time and time again. All of our labs operate under INDOT Certified Mix Producer design requirements. Our mix design lab additionally holds the impressive AASHTO R-18 accreditation (AASHTO #3024), which allows us to design mixes for FAA Airports. Regular internal audits are performed as required by R-18. This lab executes full volumetric mix designs on all materials produced for INDOT and KYTC, as well as any local government or commercial work that requires designs by contract. Although it is not always required by contract, we also carry out a minimum of one point volumetric design on any mix produced. We design every mix, ensuring that the correct combination of aggregates and the proper amount of liquid PG Binder are used and a DMF is developed prior to production. 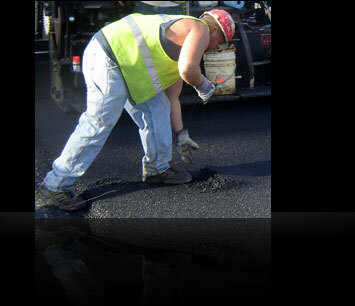 Our customers experience the peace of mind that comes with using top-notch, quality asphalt paving materials when they choose to work with us. Our commitment to quality and keeping up with the latest trends and procedures in QC/QA stand behind our exceptional asphalt materials.